The Marvel cinematic universe has many films in it, with fans desperate to keep up to date with all the visual delight that Marvel has to offer... but there is one film that may have passed all but the die-hards by! You see, Les Miserables is not just set in the Marvel universe, but features several characters both familiar and new who will factor in to future Marvel films. They look identical, with the same height, voice and appearance. Despite being a Frenchman, Jean Valjean speaks with an accent clearly from the American continent. Wolverine is long-lived, and has had many adventures in the distant past, travelling as far afield as Japan. It is hardly a stretch to believe he visited Paris during his mysterious past. During the film, Jean Valjean constantly changes his name to further disguise himself, indicating that this is perhaps not his real name at all. Jean Valjean possesses incredible strength that is comparable to mutant ability. At one point, he is recognised simply by the amazing strength he displays. 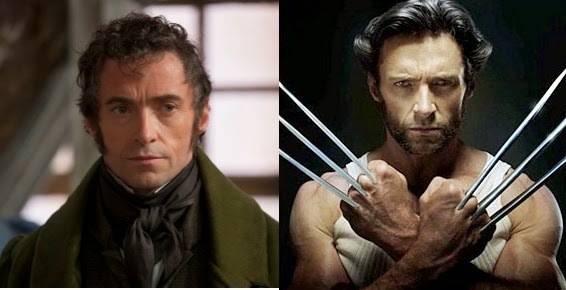 Jean Valjean also has a mutant healing factor. At the end of the film he is seen close to death, and yet minutes later he strolls out into the Paris sunlight looking fit and well, ready to start his new life having faked his death. It is worth noting that at no point in the film does Jean Valjean pop out his claws and slice any characters to death, however there is no occasion where doing so would not have raised undue suspicion. The links to Marvel go even deeper, for throughout the film Wolverine is relentlessly pursued by the one man who knows his secret, a man who calls himself 'Inspector Jarvert' but is in fact the extra-terrestrial known as 'Gladiator'. Gladiator is a Marvel cosmic character, agent of the Shi'ar Empire (long standing X-Men enemies), with Superman-like powers. Javert looks identical to 'Gladiator', having already appeared in the 2000 film of the same name. Whilst that film is set in Roman times, it must be remembered that Gladiator is a powerful alien with a potentially extremely long lifespan. Jarvert constantly meeting Wolverine throughout his life is unbelievable for the time period... unless he had some sort of tracking equipment. At one point in the film, Javert begins to sing about stars, revealing his extra-terrestrial nature. Javert's gigantic hat is the perfect disguise for Gladiator's distinctive hair. At the end of the film, having been foiled by Wolverine, Gladiator uses his superpowers to fly off a bridge. As we have seen then, Les Miserables is clearly another exciting chapter in the Marvel universe. The question may arise as to why everyone in the film communicates in song, however this may be due to the influence of an alien such as Mojo who would find much entertainment in forcing the world to sing. As we have seen in future films, this effect is no longer in place in the 20th century.